As you know if you read this blog, I love Xena: Warrior Princess and I am not about to stop loving Xena: Warrior Princess anytime soon. 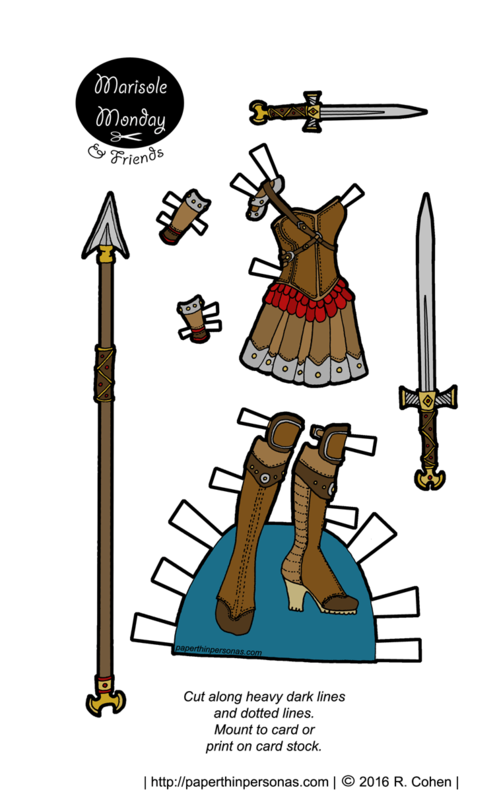 So, here’s yet another Xena inspired warrior outfit with more exposed skin than common sense dictates. I realize that there are some Xena-esque outfits in the new Wonder Woman movie (which is a super fun film), but I drew this long before saw it. I can’t claim any relation between this and that, but I am glad to see a return to absurd armor as a concept. It’s really very pulpy. I suspect if you really wanted, you could trace a lot of this back to the pulps of the 1930s and 1940s. I am reminded of the Flash Gordon paper dolls I have seen. And obviously, everyone should want Flash Gordon paper dolls. I suppose my point is that there is nothing new under the sun and everything is constantly being revamped and recycled. This recycling is part of why I love collecting reference images on Pinterest as much as I do and why I added the “Inspired By” to the tops of every post. I want people to know that rarely do these thing just “happen”. I took a poetry class in college. The professor remarked that if you wait around for inspiration to strike, you’ll spend a lot of time waiting and you won’t really spend much of it creating. In fact, I find I am at my most creative when I already am creating. Sure, everyone needs breaks, but often I find that once I start drawing for one series, other ideas flow much better for me. I am not a big Viking fan-girl. There are people out there who are just obsessed with Vikings and, mostly, I respect that. I’ve done my fair share of Viking research and drawn Viking women’s garments based on that research (read that here). 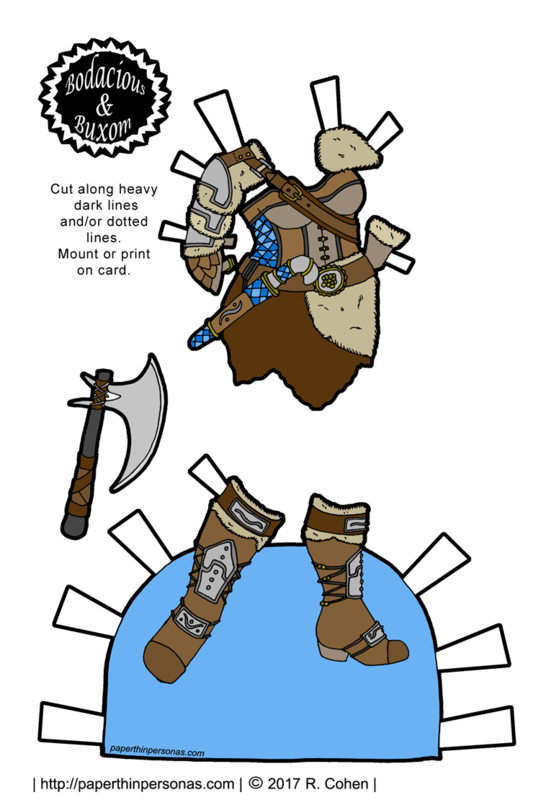 You can check out those historical Viking paper doll outfits over here. And I am here to say that this paper doll ain’t that. 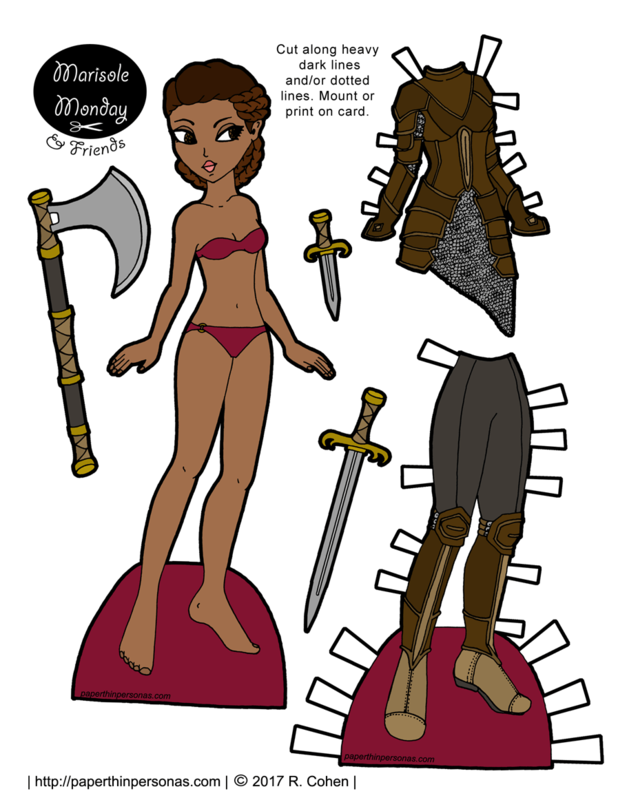 Vikings inspired today’s warrior paper doll outfit to have the same accuracy as a Wagner opera about vikings. In other words, not a whole lot of that. Rather than accuracy, I wanted to draw fur and fantasy armor. Not practical fantasy armor, but absurd fantasy armor. Made more absurd, because this armor wouldn’t keep you warm in the cold northern climate anyway. There is fur there, but it is pretty decorative rather than actually practical. Still, I had a bunch of fun drawing it. It was a hoot to create. I am happy to create things that are just fun and not really realistic or practical. Want to donate and support the blog? Join Patreon! It’s a fun place and the support really helps keep things running around here. So, I was asked by one of my Patrons, The Steger Family to create some paper dolls of community helpers like policemen, librarians, firefighters, that sort of thing, I struggled. Let’s just say my attempt at a police women ended up looking like a stripper, rather than an actual member of the police force. So, I tabled it for a while. 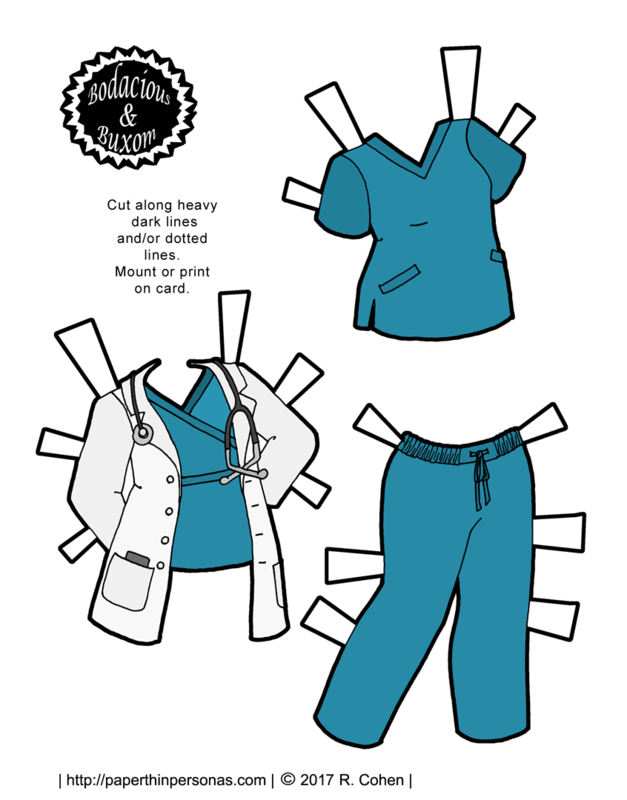 When I came back, I thought I would try something like scrubs to create a nurse or doctor paper doll. One of my friends here in Birmingham is a nurse and I’ve always really respected women in the medical field. I don’t know if this is really a doctor paper doll outfit or a nurse paper doll outfit, but I tend to think it could go either way. The hardest part was drawing the stethoscope. Not a tool I draw that often, I must say. I made the scrubs the same color as one’s I’ve seen the local hospital, but I have no idea how scrubs work. Are they like a uniform? Do people have to wear certain colors? Do certain colors mean different things? Someone in the medical field should let me know in a comment. I have no clue. Either way, here’s either a Doctor or a Nurse paper doll outfit for the B&B series to help out their community. While it might be a while before I tackle a police woman printable paper doll outfit again, I might try a firefighter. I have no idea what firefighters wear, but that’ll be some research. And I know some of my readers have been wanting a librarian paper doll for a while. Want to support the blog? Join Patreon! It’s a fun place and I really do listen to my Patrons requests. Alternatively, follow the blog through Facebook and/or spread the word on social media. Yesterday, I did a way more detailed explanation of why I drew this ninja outfit then I am going to do today. Mostly, it was because I didn’t have many ninja paper dolls. 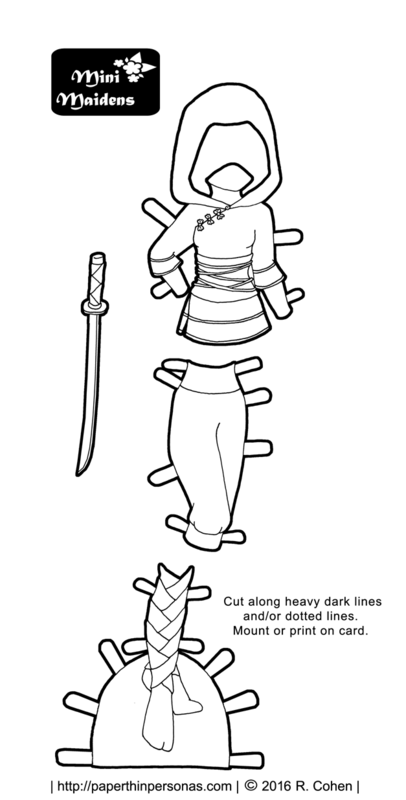 I especially wanted a ninja coloring page paper doll outfit. Why you ask? Well, because I was asked for one. 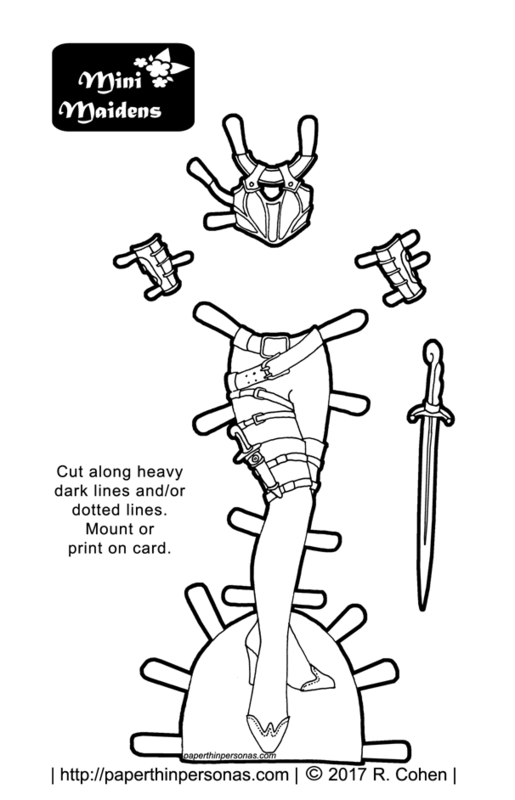 Not recently, mind you, but years and years ago I was emailed to see if my Ninjas Vs Pirates paper doll set for Marisole Monday and Friends was available in black and white. It wasn’t and it won’t be, because I no longer have the master files for it. So, when I decided to draw ninjas, astronaut and circus themed paper dolls, I knew I needed to do one in black and white. Why those these topics? I explain in yesterday’s post. So, here it is! Of course, my more recently Marisole Monday & Friend’s ninja is also available in black and white, but now there’s another option if you perfer Mini-Maidens to Marisole Monday & Friends. Everyone should have options. Seriously, I swear this logic made sense in my head at the time. Help support the blog! Donate and become a Patron! Also, I hope everyone has a great weekend. Mine should be quiet which, frankly, is exactly how I like my weekends to be. Mini-Maidens are Off to Fight a Dragon! The first time I ever tried to draw plate women’s armor, I was so nervous. Now, I find I still like to have reference photos, but I have a much better idea of how the armor goes together. Plus, I don’t actually expect anyone will be looking at my armor designs and being overly critical. Designing armor is something I really enjoy doing. Sometimes, I want to draw totally absurd women’s armor like I did a few weeks ago in this Xena inspired armor set for Marisole Monday & Friends. Other times, like to day, I want my women’s armor to be a little more practical and realistic. I keep a whole board on Pinterest devoted to fantasy armors. This image and this armor from 1580 were both inspirations for today’s armor. I really did want something that felt like a lady could wear it to go slay a dragon. Should, you know, there be a dragon out there that needed slaying. The legging like thing she is wearing under her leg armor is really just there to make it easier for the paper doll to function. Plus, when I draw more armor (assuming I do) then you can mix and match the armor tops with armor bottoms. Which brings me to this question: More armor? Yay or Nay? Let me know. Also, today is the first day of Yule. Once, in high school, a friend of mine and I went in search of a Yule Log for her in the woods, because she had read that you shouldn’t buy a Yule Log. That, apparently, was bad luck. Needless to say, it was a cold, wet, rather miserable experience that involved Devils Club, a spiky poisonous plant, and falling into a snow bank. Now, whenever anyone mentions Yule, I think of that afternoon in December in Alaska. So Happy Yule to anyone who is celebrating. May your search for a Yule Log be much less exciting than ours was. And, as always, if you like the blog, consider donating through Patreon.